Le "capitaine" Giovanni Battista Caviglia (1770-1845) fait partie de la grande histoire de l'égyptologie. Son nom est notamment lié aux fouilles entreprises sur le plateau de Guizeh. Mais en dépit de son volumineux apport dans les découvertes archéologiques liées aux pyramides et au Sphinx, il n’a laissé trace d’aucun écrit structuré, hormis quelques correspondances liées à ses divergences avec Vyse. C’est en 1816 qu’il s’intéressa plus particulièrement au Sphinx de Gizeh, qui disparaissait alors sous les sables du plateau. Ses découvertes ont été relatées par divers auteurs, dont les quatre cités ci-dessous. “Il (le capitaine Caviglia) porta ensuite ses recherches sur les environs des pyramides ; mais ce qui lui coûta le plus de peine, ce fut de mettre à découvert le devant du grand sphinx. Entre les deux griffes de cet animal colossal, il trouva un petit temple, et, sur la poitrine, une grande table de granit, ornée d'hiéroglyphes et de diverses figures sculptées, entre autres de deux sphinx. A l'entrée du temple était placé un lion, comme pour garder les approches. Un peu plus loin, et toujours en face du sphinx, il trouva un escalier de trente-deux marches qui conduisait, en descendant, à un autel muni d'une inscription grecque, du temps des Ptolémées, et ayant de chaque côté un sphinx de pierre calcaire, mais très dégradé. Depuis la base du temple jusqu'au sommet de la tête du grand sphinx, M. Caviglia compta une distance de soixante-cinq pieds. Les jambes du sphinx avaient cinquante-sept pieds de long, depuis la poitrine jusqu'à l'extrémité des griffes, qui ont huit pieds de haut. “Le capitaine Caviglia avait fait, en 1816, des fouilles courageuses dans la grande pyramide, mais la plus brillante est certainement celle qu'il entreprit pour déblayer le grand Sphinx du sable où il était enseveli. Cette fouille est rendue dramatique par les difficultés qu'il eut à surmonter, malgré une centaine d'ouvriers, pour enlever le sable qui retombait sans cesse au moindre souffle du vent ; en dépit de toutes les mesures, le vent de la nuit détruisait régulièrement plus de la moitié de l'ouvrage fait pendant le jour. Caviglia découvrit entre les pattes du Sphinx, étendues en avant, des chambres, un autel, des stèles inscrites, un petit lion couchant ; c'était une partie d'un temple ; on voyait encore sur l'autel les traces du feu qui avait servi aux sacrifices ; la plupart de ces débris ont été déposés au Musée Britannique. Sur le second doigt de la patte du Sphinx était gravée, en caractères assez distincts, une inscription en vers grecs signée Arrien. Cette signature donnerait à ces vers un intérêt tout particulier, si l'on pouvait prouver qu'elle appartient au célèbre historien que Gibbon appelle l'élégant etphilosophique Arrien. Sur d'autres inscriptions, on lit les noms de l'empereur Néron, d'Antonin et de son fils Verus. “À deux ou trois cents toises de la grande pyramide, est le fameux Sphinx. Entre les deux pattes de devant s'élevait jadis un autel. 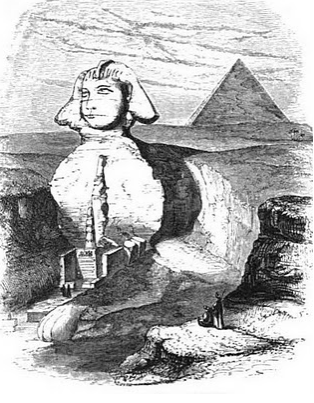 Le visage du Sphinx est mutilé ; mais on voit que sa tête est d'un caractère nubien. Cette tête colossale a été ciselée dans le roc ; elle a de 26 à 30 pieds de haut, et 16 pieds de l'oreille au menton. On ne peut calculer les dimensions du corps, qui est presque entièrement enfoui dans le sable. L'infatigable M. Caviglia a eu le courage d'entreprendre de déblayer entièrement ce monument colossal. Il y avait travaillé six semaines. La besogne était immense, car le vent qui soufflait dans cette direction poussait les sables vers le monstre à mesure qu'on le dégageait." "From various reports I learned that the French had made a considerable excavation in front of the Sphinx, and that they had just discovered a door when compelled to suspend operations. This account was repeatedly confirmed by the Arabs, several of whom declared that they had been present at the discovery ; and said, that the door led into the body of the Sphinx ; while others affirmed that it conducted up to the second pyramid. Though little stress could be laid on such statements, they still rendered Captain Caviglia very unwilling to give up his researches, without at least doing all in his power to ascertain the fact. To this end he first began to open a deep trench on the left, or northern side, opposite the shoulder of the statue ; and, though the sand was so loose, that the wind drove back frequently during the night more than half of what had been removed in the day, yet he managed by the aid of planks, arranged so as to support the sides, to dig down in a few days to the base. The trench, however, being no more than twenty feet across at the top, and not above three feet wide at the bottom, the workmen were evidently placed in a dangerous situation ; for if any large body of sand had fallen in, it must have smothered those who were employed below. It was, therefore, found necessary to abandon this part of the attempt. By what had been done, however, the height of the statue from the top of the head to the base was ascertained, and it was also found that the external surface of the body was composed of stones of various sizes, put together with much care. The form of the masonry was not very regular, but it consisted of three successive ledges, sufficiently broad for a man to stand upon, and intended, probably, to represent the folds of a mantle or dress. It seemed to have been added by the Romans. The result of the first operation not proving satisfactory, Captain Caviglia began a large excavation towards the front, in which he employed, from the beginning of March to the end of June, from sixty to a hundred labourers. Many interesting discoveries were now made. Among other fragments that were found, were portions of the beard of the Sphinx, and the head of a serpent. Most of these lay in a small temple, ten feet long and five feet broad, which was immediately below the chin of the statue, and which contained, according to Pliny, the body of Amasis, the first king of the eighteenth dynasty. Between the front walls of this temple, a small lion of good workmanship was found, with the head towards the image ; and, as small statues of the bull Mahdes are similarly placed in Indian temples, I conceive that this statue was in its original position. Fragments of other lions, rudely carved, and the head and shoulders of a Sphinx, were likewise discovered. All these remains, together with certain tablets found in the small temple, the walls, and the platform, had been ornamented with red paint ; which colour, according to Pausanias, was appropriated in Egypt, as in India, to sacred purposes. A large part of the left paw was uncovered, and the platform of masonry was found to extend beyond it. In the course of a fortnight Captain Caviglia had removed the sand from the paw, and from the outer walls of the temple, in front of which was an altar formed of granite. 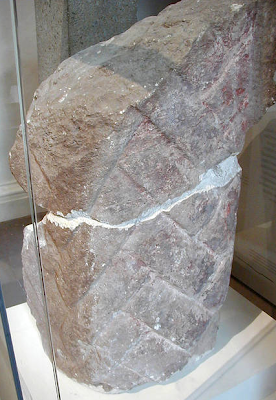 It is now in the British Museum, and has had at the angles projecting stones, which may be supposed to have been called the horns of the altar. This fragment still retains the marks of fire - the effects, probably, of burnt offerings. 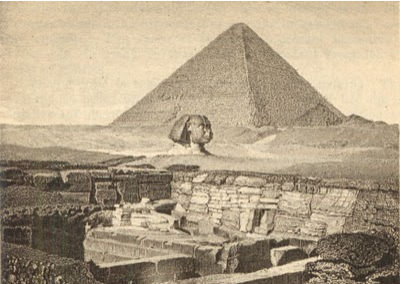 Captain Caviglia succeeded in laying open the base of the Sphinx, and in clearing away the sand in front of it, to the extent of more than a hundred feet. Many short Greek inscriptions were indistinctly cut on the paws of the statue. They prove that the image was held in high veneration ; confirm the expression of Pliny "quasi silvestre nemus accolentium " and contain various phrases, which elucidate many doubtful points in the sculptures of the adjacent tombs. It is scarcely possible for any person, unused to occupations of this kind, to form an idea of the difficulties which Captain Caviglia had to surmount when working at the depth of the base ; for, in spite of all his precautions, the slightest breath of wind or concussion set the surrounding particles of sand in motion, so that the sloping sides crumbled away, and mass after mass tumbled in, till the whole moving surface bore no unapt resemblance to a cascade of water. Even when the sides appeared most firm, if the labourers suspended their work only for an hour, they found that the greater part of their labour had to be renewed. This was particularly the case on the southern side of the right paw, where the people were employed for seven days without making any sensible advance, because the sand rolled down in one continued and regular torrent as fast as it was removed. He therefore only examined the end of the paw, when an imperfect description was discovered on the second digit, and a few dedicatory phrases, addressed to Harpocrates, Ares, and Hermes. At the distance of about two feet to the southward of the right paw, the platform abruptly terminated. It was therefore supposed that the Sphinx was placed upon a pedestal ; but, by extending the operations in front of the statue, the platform was found to be continued, and the steps were discovered. They were bounded on each side by walls formed of unburnt brick, like those which enclosed the ancient cities and temples of Egypt. The inner sides of the walls, nearest the steps, were lined with stone, and coated with plaster ; the stonework, however, appeared comparatively modern, for upon several of the blocks were the remains of Greek inscriptions, which alluded to other buildings. Another of the inscriptions recorded repairs, which were performed by the orders of Antoninus, and of Verus. The walls appeared to branch off towards the north, and also towards the south, and to form a large enclosure around the Sphinx; but their direction was not ascertained. The steps, about a foot in breadth and eight inches in height, were thirty in number. They ended abruptly on the northern side, so as to leave a passage between them and the wall. This passage was not examined. On a stone platform, at the top of the steps, was a small building, which, from its construction, and from various inscriptions found near it, seemed to have been a station whence the emperors, and other persons of distinction who visited the Pyramids, could witness the religious ceremonies performed at the altar below. An inscription on the front of it was much worn."